At last, civilization! By which I mean Bishop, with a major chain grocery store and a Taco Bell. A few burritos and a shopping trip later, I headed up to Lake Sabrina to find a place to sleep in the overnight parking. I was surprised to find a familiar-looking car in the line, which did in fact belong to Darien, who was putting up a hard route in the area. Small world. Then in the morning I was surprised to see Tricia, who I met briefly a few years ago, recovering from a rockfall incident by doing part of the challenge. Even smaller world. Today’s challenge peak, Spencer, was lower than the saddle we crossed to reach it, Haeckel Col. A bunch of us started off on the long trek past the lake and up into the hills, talking and dodging horse dung. I found myself in the lead, and immediately led people to the wrong side of the granite ridge to Haeckel Col. Things worked out, though, and we followed the ridge to some nice lakes and a long boulder field to the col.
From the col there was a long, gradual descent to a saddle, punctuated by a surprise cliff. Bob, Brian and I looked at it, and Bob decided to find another way. Brian and I explored more persistently, and eventually found separate 4th class routes to the saddle, arriving a couple hundred yards behind Bob. From there it was a steady class 2 scramble to the summit, which still had its 1941 register box. We signed in and enjoyed the view while waiting for Tricia. 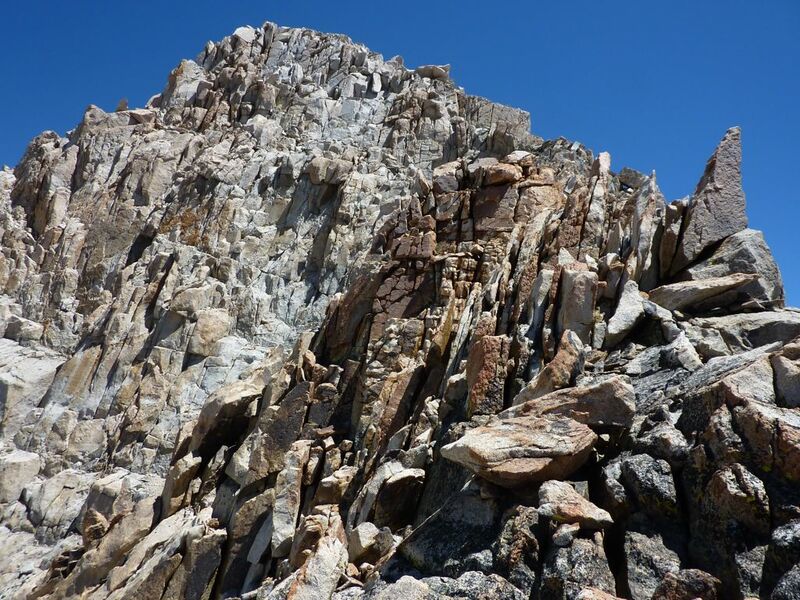 Though Spencer is a low summit, it has a view of almost the entire Evolution traverse (to just before Lamarck Col) and the JMT from Evolution Basin to near Muir Pass. After lunch, we headed back to the col, where Bob headed back to the trailhead (the long way) and Brian and I started up the northwest ridge of Haeckel. The crux was probably getting around the spire between Haeckel Col and Haeckel. After that, it was class 2-3 scrambling to just before where the ridge turns east, then fun class 3-4 to the summit. While not quite a “classic” as was claimed, it was a fun climb. Ron, who had climbed the route earlier, had somehow managed to wedge the register canister between some heavy rocks, and it took both Brian and I to lift the rocks and free it. We sat around on the summit for awhile deciding what to do next. I had thought of traversing over Wallace and Clyde Spires to Echo Col, but the prospect of crossing the Wallace scree nightmare deterred us, and we headed back down to the ridge. I left Brian at some point, and after passing some people with folding chairs and a picnic table at the lake, met the mule trains that had brought their gear. Unfortunately, Lake Sabrina is yet another place where lazy people can pay to have horses ruin the trail dragging them and their stuff into the wilderness. Farther down the trail, I was surprised to catch Bob, who had spent an hour finding a “shortcut” through the cliffs above Hungry Packer Lake. Darwin and Mendel, east from Spencer.